National Pasta Day is celebrated worldwide. 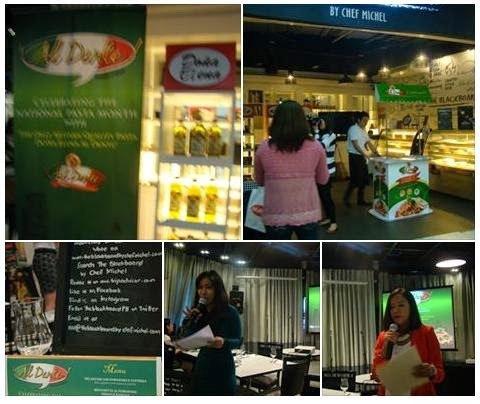 It falls on October 17th this year and as the National Pasta Month comes to end, Doña Elena Al Dente invited mommy bloggers to join in the festivities and draw attention to everything pasta. Pasta is typically made from an unleavened dough of a durum wheat flour that is mixed with water or eggs and formed into sheets or various shapes, then cooked and served in a variety of dishes. The highest quality of dried pasta is made with pure durum semolina flour and water. Pasta can be made dry (pasta secca) or fresh (pasta fresca). There are over 310 pasta shapes known variably in 1300 different names and there are over 350 varieties of dried pasta in Italy. Doña Elena Al Dente is the only Artisan Quality Italian Pasta made from using high quality, 100% durum wheat semolina or hard wheat. Doña Elena Al Dente uses special bronze dies which leaves a rough surface that create ridges on the pasta that are great for absorbing sauces, be it cream, oil or tomato-based. Unlike other pasta with only 6% protein content, Doña Elena Al Dente has 13% protein, a result of the slow-cooking process which preserves its nutrients. Doña Elena Al Dente is also GMO-free, 100% certified all natural. Guests were treated to pasta dish creations. Chef Michel Cottabaren showed us how to prepare recipes using Dona Elena Al Dente Penne Rigate, Dona Elena Al Dente Fettucini and Dona Elena Al Dente Lasagna. Doña Elena Al Dente takes the regular pasta dishes to the next level by providing high quality pasta that guarantees "al dente" or “firm to the bite” every time you use it! The pasta dishes made from Doña Elena Al Dente are best paired with Doña Elena Olive Oil and Doña Elena Mediterranean products. Learn more about Doña Elena Al Dente at http://www.flyacecorp.com/.